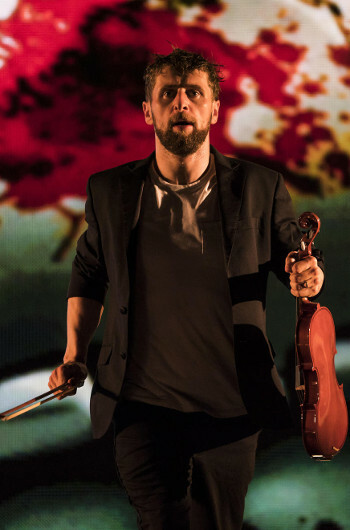 Supported by the European Union's "Creative Europe" program, the award-winning production of The Second Violinist by Donnacha Dennehy is available for online viewing until August 2018. A coproduction of Irish National Opera and Landmark Productions, and the 2017 winner of the Fedora Generali Prize for Opera, The Second Violinist is part love story, part drama, and part thriller. It removes boundaries between opera and theatre, past and present, fact and fiction, revealing a troubled musician who starts to experience a mental breakdown as a performance approaches. Dennehy notes: "Subtext is as important as text to me. The music, as it were, powers the subtext; and an important ingredient in the music for The Second Violinist is a thread made of deconstructed, re-fashioned strains of Gesualdo. The main protagonist's interest in the music of Gesualdo is sporadically made explicit in the actual text of this opera (especially in the projected messages between him and Scarlett38) but it carries even greater portent in the score. These strains even inform the flowering overtone textures that become ever more radiant as the opera proceeds, creating a friction between the almost ecstatic luminosity of the score and the brutal reality of the plot." Enda Walsh, the opera's librettist, directed the production which features one of Ireland's leading actors, Aaron Monaghan, in the titular role. Also featured in the cast are singers Máire Flavin, Sharon Carty, and Benedict Nelson. Ryan McAdams conducted the Crash Ensemble and the Wide Open Opera Chorus. Landmark Productions & Irish National Opera will bring The Second Violinist to the Barbican in London for performances in September 2018. Dutch National Opera will present the production in Amsterdam in March 2019. For more information about The Second Violinist, please contact Peggy Monastra and visit TheSecondViolinist.ie.